In the event of an evacuation follow arrows on signs posted around town. Before an event even occurs, you should take steps to keep you and your family safe in the event of an emergency. Create a family Emergency Operations Plan which identifies what type of hazards and potential risks your jurisdiction faces and what you will take with you and where you will go if you are asked to evacuate, etc. A three-day supply of water (one gallon per day per person). A supply of non-perishable packaged or canned food that does not require cooking. The Emergency Management office will be able to identify your evacuation route that includes designated safe areas, areas to be evacuated during a hurricane emergency, and safe evacuation routes to shelter. See evacuation map. See below for shelter locations also. Hurricanes can cause extensive flooding, not just along the coastline, but far inland as well. Flood insurance is valuable financial protection. Your annual preparations for the hurricane season should include checking to see that you have a supply of non-perishable food, drinking water containers, waterproof matches, a lantern with fuel, a first aid kit, fire extinguisher, a battery-powered radio, flashlights, and extra batteries. The National Weather Service can usually provide up to five days of advance warning. The Weather Service of NOAA issues advisories when hurricanes approach land. A "hurricane watch" is issued whenever a hurricane becomes a threat to coastal areas. If in the area, listen for further advisories and be prepared to act promptly if a hurricane warning or evacuation order is issued. "A "hurricane warning" is issued when hurricane winds of seventy-four miles an hour or higher, or a combination of dangerously high water and very rough seas, are expected in a specific coastal area within twenty-four hours. Precautionary actions should begin immediately. Keep tuned to a local radio or television station for the latest National Weather Service advisories as well as instructions from local officials. Check battery-powered equipment. Your battery-operated radio could be your only source of information, and flashlights will be needed if utility services are interrupted. Buy extra batteries. Keep your car fueled should evacuation be necessary. Some service stations may be closed or inoperable after the storm strikes. Leave early from low-lying beach areas that may be swept by high tides or storm waves, or mobile homes that are vulnerable to overturning in strong winds. Store drinking water in clean bathtubs, jugs, bottles and cooking utensils as your town's water system could be contaminated or damaged by the storm. You should have a gallon of water per family member for a minimum of three days. Obtain a minimum of three days supply of prescription medications and medical supplies. Secure outdoor objects that might become caught in the wind. Moor your boat securely well before the storm arrives, or move it to a designated safe area early. Do not stay on your boat or you may drown. Be alert for tornado watches and warnings as tornados are frequently spawned by hurricanes. Should your area receive a tornado warning, seek shelter immediately in an interior bathroom or small hallway, preferably below ground level. Remain indoors. Blowing debris can injure and kill. Travel is dangerous. Be especially wary of the "eye" of the hurricane. If the storm center passes directly overhead, there will be a lull in the wind lasting from a few minutes to half-an-hour or more. At the other side of the "eye" the winds will increase rapidly to hurricane force, and will come from the opposite direction. If you are in a public shelter, remain there until those in charge inform you that it’s safe to leave. Keep tuned to your local radio or television station for advice and instructions from local government about emergency medical, food, housing, and other forms of assistance. Stay out of disaster areas and do not use the telephone except for rescue, serious injuries or emergencies. Avoid and report loose or dangling wires and broken sewer, gas or water mains to the appropriate utility company. Prevent fires by not using candles if at all possible. Check buildings for possible collapse or weakened structure before re-entry. Hurricanes moving inland can cause severe flooding. Stay away from riverbanks and streams until all potential flooding is past. If power is off, check refrigerated food for spoilage. Do not use tap or well water until you are sure that it is not contaminated. Flooding causes more than ninety percent of the disaster related property damage in the United States each year. Preparation is the key to surviving a flood and reducing property damage. Most homeowner policies don’t cover flood damage. To determine your risk, contact your local Emergency Management Coordinator. Remember that there is a thirty-day waiting period before flood insurance policy coverage goes into effect. You may need National Flood Insurance Policy coverage even if you do not reside in a high-risk flood zone. Check with your insurance agent or broker. Elevate your utilities a minimum of two to three feet above the base flood elevation. If you have a fuel tank, anchor it to a large concrete slab whose weight can resist the force of floodwaters and flotation. Install sewer backflow valves to prevent sewage entry into your home. Obtain a battery powered weather radio. Pay attention to the latest information when heavy rains occur and to flash flood and river flood watches and warnings issued by the National Weather Service. Never drive your vehicle through floodwater. It may be deeper than you realize and could trap you in your vehicle. Keep extra cash on hand since an extended power outage may prevent you from withdrawing money automated teller machines or banks. Keep a supply of non-perishable foods, medicine, baby supplies and pet food as appropriate on hand. You should have a water supply of one gallon of water per person per day for a minimum of three days on hand as well. Have one or more coolers for cold food storage, in case the power is prolonged. Perishable foods should not be stored for more than two hours above forty degrees Fahrenheit. Have an emergency power supply for anyone dependent upon medical equipment requiring electricity. Keep a supply of flashlights, batteries, and a battery-powered radio on hand. Avoid opening the refrigerator or freezer. Food should be safe as long as the outage does not last for more than four to six hours. Do not use candles, as they can pose a fire hazard. Connect only individual appliances to portable generators and never plug a generator into wall outlets, as they can feed electricity back into the power lines, putting you and line workers in danger. Use gas-powered generators in only well ventilated areas. When driving, be careful at intersections as traffic lights may be out. Turn off all but one light to alert you when power resumes. Check on elderly neighbors, friends or relatives who may need assistance. Resist the temptation to call 9-1-1 for information - that is what your battery powered radio is for. Keep space heaters away from flammable materials and NEVER leave them unattended. When using supplemental heating sources such as fireplaces or kerosene space heaters, make sure you have proper ventilation and a carbon monoxide detector in place. Always take your space heater outside to fill it. Install smoke alarms and carbon monoxide detectors. Replace the batteries every six months. Move all vehicles inside the garage if possible. Never leave a vehicle running with the garage doors down. Insulate all exposed water pipes outside the home. Close off unoccupied rooms in the home. DO NOT use charcoal burning devices. Wear layers of loose-fitting, lightweight, warm clothing. Remove layers as needed to avoid overheating, perspiration and subsequent chill. Set the thermostat in your house no lower than fifty-five degrees. Allow a slow trickle of water to flow from both the hot and cold water faucets, especially if the faucet is on an exterior wall. Open cabinet doors to allow heat to get to un-insulated pipes and appliances near exterior walls. Drink plenty of non-alcoholic fluids and eat high caloric foods. Do not drive unless the roads have been cleared by snowplows. 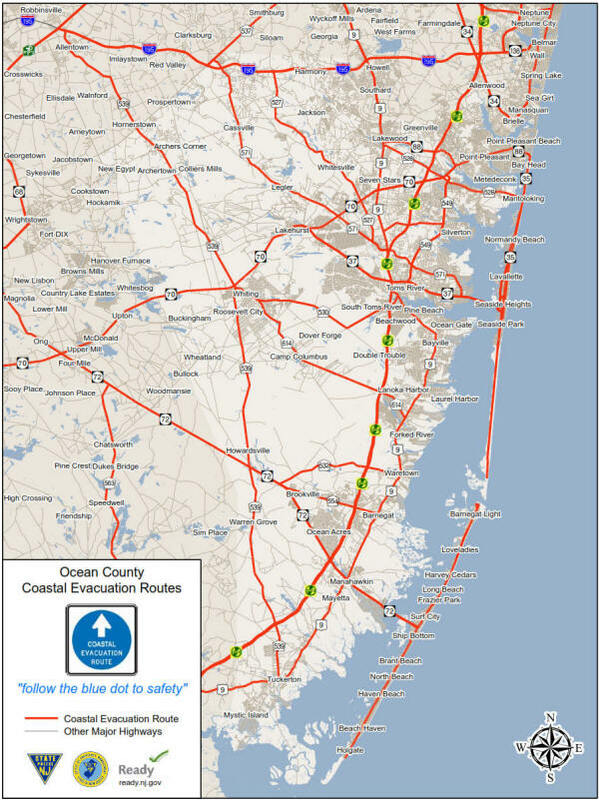 If you need transportation for a critical medical treatment or a critical prescription filled, call the Ocean County Sheriff's Department, Office of Emergency Management at (732) 341-3451 or toll free (800) 331-8152. Never try to thaw a frozen pipe with an open flame or torch. Shut off water and call a licensed plumber. Clear walkways and sidewalks to prevent injury, but avoid overexertion. Report damage, such as broken pipes and downed tree branches or power lines to the utility company, if appropriate. Avoid the area to prevent personal injury. Animal Emergency Preparedness and H.E.L.P. In the event of disasters, you need to take steps to not only protect yourself but your pets and livestock as well. Plan ahead of time for a safe place to take your pets and livestock in the event of an evacuation. During an evacuation, shelters run by the American Red Cross cannot accept animals or pets, except for service animals who assist people with disabilities. Find out whether friends, relatives, pet-friendly hotels, boarding kennels or , or humane societies, stables or racetracks, or private farms outside your immediate area can shelter your animals in the event of a disaster. Also, make arrangements with trustworthy neighbors for pet and livestock care if a disaster strikes and you cannot get home in time to evacuate. This person should have access to your animals and be familiar with them. To determine the locations of established pet shelters and/or pet friendly shelters, call your Municipality ahead of time or listen for announcements. Some shelter managers try to provide space for pets that are leashed and have their own portable carriers. Re-sealable plastic bag containing copies of Pet License, microchip, tattoo and/or ID, photos of pet (from all angles and with owner(s), proof of up to date vaccinations and name/phone of their veterinarian (most boarding facilities and emergency animal shelters will require proof of current rabies and annual vaccinations).